Judging Flannery: Can You Love The Work And Not The Author? 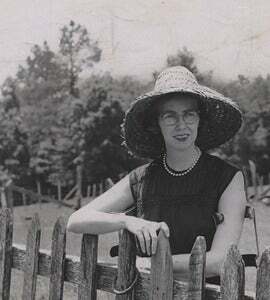 A new biography of Flannery O'Connor is making some people feel uncomfy with the realities of the author's life. Should it affect the way we read her fiction? O'Connor's zeal, sanctimony and intolerance are sometimes suffocating. When Betty Hester, a pen pal who was joining the church under the writer's guidance, admitted to being kicked out of the Army for a lesbian affair, O'Connor responded in classic "love the sinner, hate the sin" fashion. Worse, she actively goaded another friend, deeply committed to the civil rights movement, with racist jokes. Not only did O'Connor tell the jokes, she apparently relished them, saving them up and spinning them out in a series of letters that have never been published. That she was (at times grudgingly) in favor of equality herself doesn't lessen the blow of this disclosure. That O'Connor's views could be less than progressive, that much of her rhetoric was frankly racist and deliberately so, even heightened for comic effect, is no secret; in editing her letters shortly after O'Connor's death, her friend Margaret Fitzgerald deliberately excised the more offensive letters. The ambiguity of her views is evident in her more famous "race" stories - "Everything That Rises Must Converge," and "Revelation" - in which black characters are frequently portrayed as suffering for the sins of white Christians, even as she condemns the ingrained racism and sanctimony of the New South. There is no "explaining this away" or "justifying it"; it's a reality of the author and incidentally manifest in her fiction. Those readers who claim such admiration of her work but express shock seem disingenuous; whatever else she was, O'Connor was no dissembler. Why, as the review says, is this book "a curse" to O'Connor's fans? Because she was often racist? This was manifest to anyone with working knowledge of her oeuvre or her biography. It's tempting to reduce her to gimlet-eyed wise woman surrounded by peacocks and sanctified by pain and early death, with the tiny asterisk of her frequent racism, but she was uncomfortably resistant to such treatment even in her lifetime. I get Newton's discomfort; because we love O'Connor's work, in some way we want her to be perfect, to feel as we do about things, so that we can better understand her writing and, more to the point, embrace it fully. And yet, why is it necessary to like or sympathize with a writer to appreciate her strengths and complexities? There is, perhaps, a modern sense that within the realm of fiction there must be a certain shared understanding, particularly amongst women writers - but isn't this terribly limiting? Flannery O'Connor is not interesting in spite of her views, repellent though they may at times be. Rather, she is indivisible from them, frankly and openly.